Aendryth's Eldritch Compendium is the title of a thick black tome of spells arcane, unusual formulae, and strange magic items developed and written by a mighty wizard known as Aendryth the Eldritch Wizard, or simply, “The Eldritch,” who knew great renown some decades ago. Hounded by his former arcane master, Aendryth has not been seen in civilized lands for nearly 20 years. Some say he lives today as a hermit, others claim to see him now and again in disguise in far-distant ports. While many have attempted to adapt his works in that time, most have failed to capture the artistry with which he wove these spells. His friends and well-wishers hope that someday he will return. 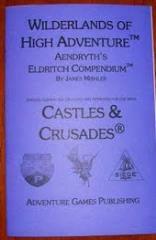 Designed and approved for use with Castles & Crusades, Aendryth’s Eldritch Compendium adds a mix of new, interesting, and potent spells to a Wilderlands of High Fantasy campaign or any other campaign setting.